Nobody knows the waters you fish better than you and your fellow fishermen. While you are trolling the shorelines and the depths, Quickdraw Contours mapping software creates HD fishing maps of the places you’ve been. No special knowledge is required. 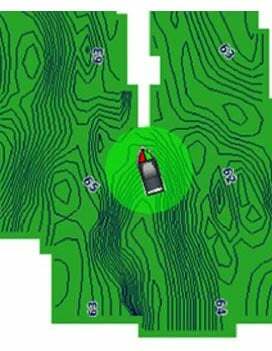 STRIKER Plus 4 can now store up to 2 million acres of your Quickdraw Contours maps with 1’ contours. The STRIKER Plus 4 fishfinder includes Garmin CHIRP technology for a higher level of clarity and detail that you have come to expect from Garmin. 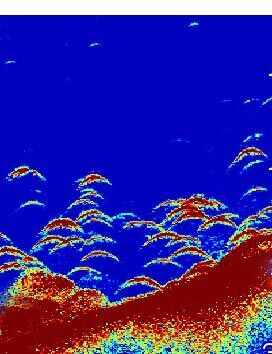 Crystal-clear sonar images provide remarkable target separation and resolution in shallow and deeper water. Bottom contours are more visible, even at higher speeds, and signal noise can be suppressed at greater depths for a timely interpretation of what’s below. GPS also allows STRIKER Plus 4 to show your speed on screen, so you can be sure you’re trolling at the right speed for the lure you’re using or in wake-controlled areas. The STRIKER Plus 4 fishfinder makes fishing a breeze, and it’s built to work in any environment. The bright, sunlight-readable display gives you a clear view of what is below your boat, even on the brightest days. And the larger screen gives you a better view of what is happening below the boat. The intuitive user interface makes it simple to navigate to whatever feature you need, so you are ready for anything on the water.